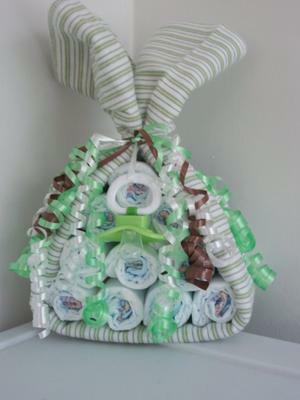 Diaper Cakes by Wendy was established in 2008 by a stay at home Mom of 2. I offer boutique quality items made with loving care. Every item is made with name brand baby products, never cheap store brands. Every item is made to be taken apart and used for your new bundle of joy. These unique diaper babies are made with 35+ Pampers brand diapers, a 0-3 months footed sleeper or baby gown, a hat, pacifier, and a receiving blanket. Everything you need to bring home your new bundle of joy after delivery! All wrapped up in tulle, imagine the guests' reactions when they see this unique centerpiece at your baby shower! Can be made to match any colors/theme! The washcloth rose bouquet is made with 6 high quality 9" x 9" baby washcloths, made to look like a dozen roses. Can be made to match any colors/theme. 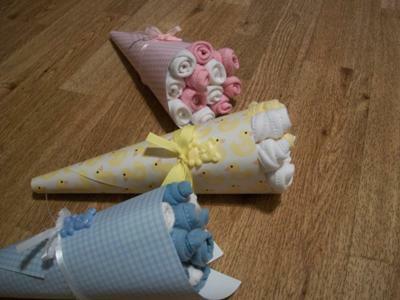 My stork bundles are made with 10 size one Pampers diapers, a receiving blanket, and a pacifier. If the mom-to-be prefers not to use a pacifier, I can substitute a small toy. 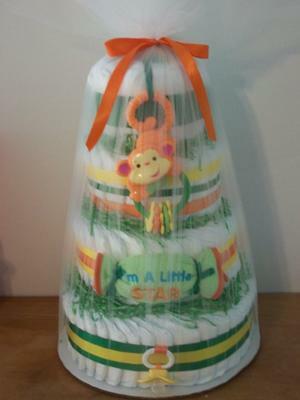 My diaper cakes come in all sizes and shapes, and are more affordable and a better quality than any other brand! I offer free shipping and my cakes are boutique spiral style cakes, not the rolled kind where the new mom will have to unroll every single diaper before using it. The pictured cake is a four tiered jungle theme cake, M2M the Fisher Price Rainforest theme! Your mom bought one for my grandniece. Very nice.